Practice tests, solutions, and tips to help you pass employers' logical tests. Logical reasoning tests are a broad group of aptitude tests which test candidate’s problem solving ability. These tests may be encountered for any position at any level of recruitment, but they may be particularly common when recruiting for positions which require significant problem solving ability or higher use of logic. AssessmentDay offer numerous types of logical reasoning test which can help you perform to your best in the real thing. Practising logical reasoning tests is an ideal method of preparation as it allows you to learn from your mistakes, improving performance with every practice trial. Similarly experiencing time limits, the test layout and the overall test experience can help ease worries and anxieties about the test by familiarising yourself with them. It goes without saying that a candidate that has undertaken a logical reasoning test numerous times and seen their prior mistakes, and learned from them will be less nervous than a first time test candidate. This free logical reasoning test contains just 12 questions and is rated as easy. This is just a taster to get you warmed up. This free logical reasoning test contains 21 questions and has a time limit of 21 minutes. 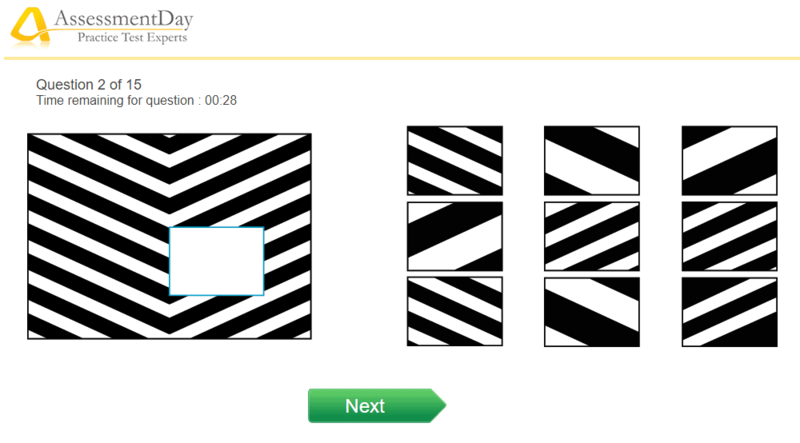 This test is rated as difficult and is about the same difficulty as real numerical tests graduate employers use. Deductive reasoning involves a general rule or principle that leads to a specific conclusion. These tests will evaluate and measure a candidates ability to make logical arguments and draw sound conclusions based on provided data, as well as identify flaws in a piece of information. As a result this is a useful tool in selection procedures as this type of reasoning will be used in the workplace. This type of reasoning will often be used in verbal reasoning tests and numerical tests, and is therefore very likely to be encountered in recruitment processes. Abstract reasoning, also known as conceptual reasoning measures your lateral thinking ability. In these tests candidates will be tested on their ability to identify relationships, patterns and trends. Candidates will be provided with a series of images that follow a logical sequence or underlying rules. This may include following a rule in a sequence, identifying a code or finding a missing diagram. Diagrammatic reasoning is a specific form of abstract reasoning. Tests which assess this ability will typically show a flowchart of diagrams and symbols, with an input and an output. Candidates will need to identify which inputs effect diagrams, and therefore generate a specific output based on those rules. Different test publishers use different names for their assessments. The term logical reasoning is used by TalentQ. Other companies may call their test abstract, inductive, or diagrammatic reasoning. It is good advice when being asked to sit a logical reasoning test to speak to the person who invited you and ask for a bit more detail; they may even give you a few example questions so you know what to expect. the important feature of these tests is that they are adaptive. That is to say the difficulty of each question is automatically determined by your performance in the previous question. So the questions become more difficult as you progress in order to quickly find your level of logical reasoning ability. There are typically 12 questions to these TalentQ logical tests and a time limit of 75 seconds per question. this test published by Kenexa is actually very similar in style to what SHL call an inductive reasoning test. They are effectively the same thing; the candidate is asked to select which diagram fits within the given series from a choice of five options. Typically Kenexa will give the candidate 20 minutes for 24 questions for their logical reasoning test. The grid-style of symbols each following a pattern is also used in the Ravens Progressive Matrices assessments. There are two levels of this test: Advanced Progressive Matrices (23 questions, 42 minutes) and Standard Progressive Matrices (28 questions, 47 minutes). Logical reasoning tests of all kinds can be nerve racking, particularly ones which are time limited. As a result it is important to stay calm as to allow optimum performance during your exam. A small amount of anxiety can be a performance booster, maximise focus and therefore performance. However serious test anxiety can severely hamper performance. Proper practice, enough sleep the night before and deep and regular breathing can all help settle your nerves, and perform to your best on the day of your test. Learning as much about the test beforehand can help you dive straight into the test once you have received it, saving you time. Similarly after researching the test, and the logical abilities which it assesses, can help you hone these skills and ensure you demonstrate the particular aptitude required for the test, optimising your performance. If an employer states that you will need to undertake a logical reasoning test, it is important to gage what type of logical reasoning will be tested due to the broad nature of logical reasoning. Don’t be afraid to ask for clarification to identify which logical reasoning test will be used, and which logical reasoning skill will be tested as this information will be invaluable for your pre test preparation. A general tip for logical reasoning tests is to figure out the correct answer/sequence/rule before looking at the multiple choices. This way once you have an idea in your head of the correct answer, you can simply pick it out. If you look at the multiple choice answers first, you will be more inclined to pick the answer which best looks like the correct answer, rather than take the time to evaluate it logically. Your logic will be subject to more bias if you base your answer on which answer seems correct on face value, instead of evaluating it using the logical skills being tested. Logical reasoning is a very broad category of skills, and this is reflected in the wide variety of tests on the market to assess these abilities. Ensuring that you are fully aware of what tests are assessing, and which logical skills are being tested is an extremely important step in preparing yourself for your test. If an employer has asked you to take a logical reasoning test, it means that you are considered a potential employee for that organisation. Take this as a compliment and a confidence booster, and remember that the experiences of these recruitment procedures are valuable experiences in themselves, which will transfer to future job applications.